Hi folks, just getting ready to bolt stuff back together on my truck and am trying to figure out what goes on first, does the three speed warford bolt up to the frame then engine/transmission goes in, or can I drop in the engine/transmission then attach the warford after, I'm just not sure if there's enough clearance for the warford to slide on once the motors in or not. Thanks again for the help. Last edited by pinesdune on April 12th, 2018, 8:33 pm, edited 1 time in total. My guess is when starting with a bare frame is warford or dual high, attach the U joint for the rear axle and attach that next so you can have a stable platform - also a way to move the driveshaft to align the trans to warford. Then engine trans combo last. Make sure you got all the u joint gaskets and stuff about a 1lb can of grease inside the u joint cavities. And dont forget the bowl that goes on over the U joint. It appears that you have a Warford designed for connection to a 3 speed. You must have already acquired the correct parts to connect to a 4 speed. Assuming that is correct, then those part include the coupling shaft rear support (shown below). The Warford is just a replacement for the coupling shaft. It is installed/removed in the same manner as a coupling shaft. That support shown below is installed from the rear side of the #3 frame cross member after the Warford is connected to the 3 or 4 speed. 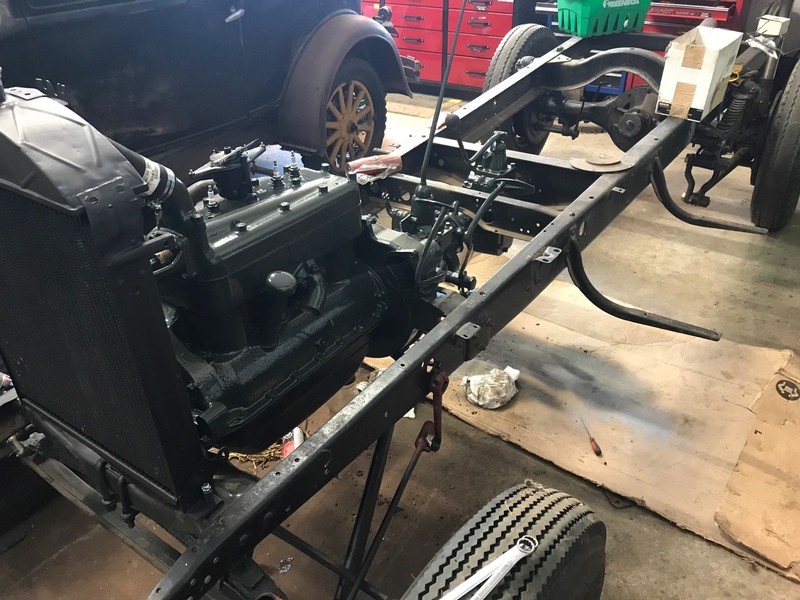 The engine/4-speed would be installed first, the Warford has room to be installed since it can pass back through the #3 frame cross member (without the rear support installed) for a short distance. 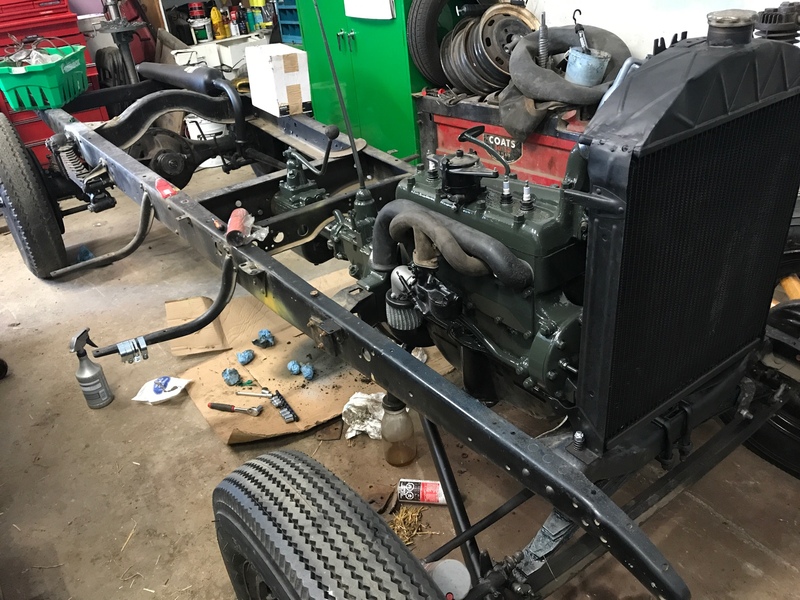 The reverse applies for removing a coupling shaft (or dual high or Warford) - the rear axle must be moved back to allow removing the rear support. I've just been through this exercise and I mounted the Warford first . That way, you can turn the Warford shaft to get the universal splines to line up on the drive shaft. I supported the Warford with a floor jack. 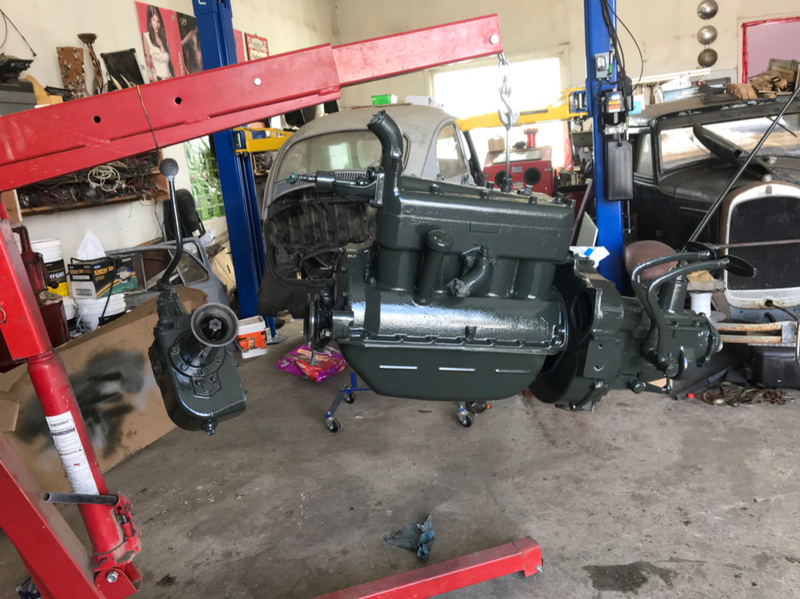 Then the motor and transmission were lift and lined up and as soon as the transmission universal lined up, it just slid straight back on to the front of the Warford and I dropped it down on to the mounts. Whatever you do, don't put your fingers in to line up the universals as it can move back quickly when it lines up!